The best kitchen cabinet storage solutions range from blind corner cabinet optimizers to cutlery organizers. With the variety of these tools available today, you can definitely find something to make your kitchen much better organized. These simple solutions can help you use all the space you have available. 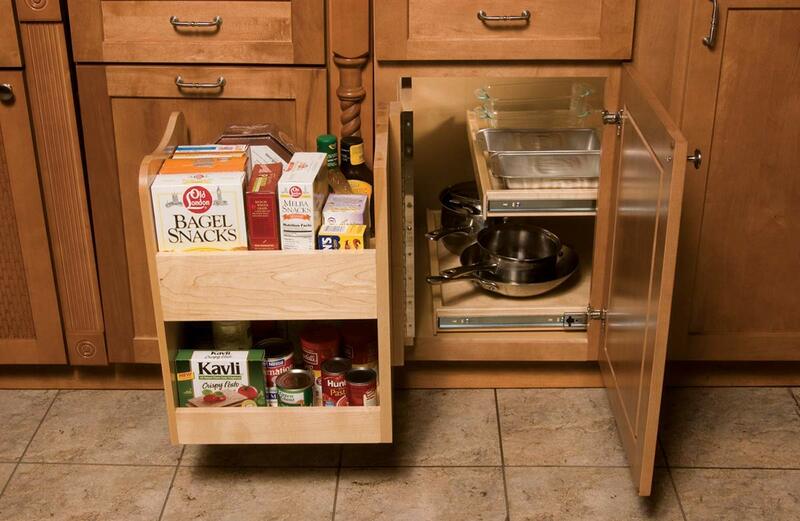 Not only will this make it easier to fit all your stuff into your pantry. This will also ensure your kitchen looks far more attractive and neat. And my personal favorite benefit of efficient organization is that everything is easy to reach. Therefore, the whole process of cooking becomes much easier and faster. Blind corner kitchen cabinets are usually the main ‘space wasters’ in the room. They can be spacious by default, but their placement usually allows for only limited access. Therefore, if you don’t use any specialized kitchen cabinet organizers, you won’t be able to use all of that space. 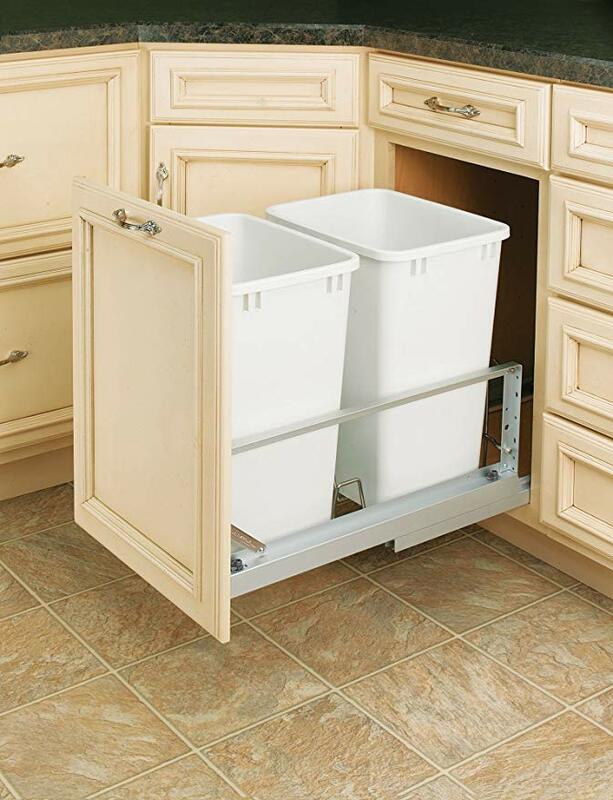 Blind corner optimizers should be the first on your ‘to buy’ list of kitchen cabinet storage solutions. They are extremely versatile in design. Go for options with rollout shelves if you are looking for maximum convenience. This will be a good option for small kitchens where the cabinets are rather tiny and hard to access by default. Choose a blind corner optimizer made with durable and sturdy materials. Check if it’s compatible with your cabinet depth and opening type (left or right) before buying. 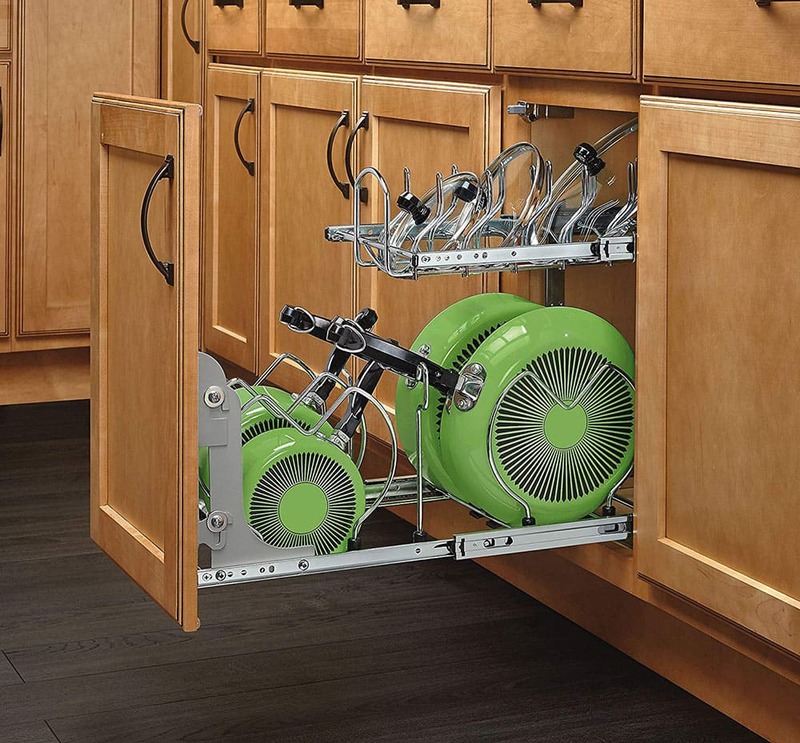 The ‘cloud’ type of kitchen cabinet organizers is a perfect choice for those who have blind corner cabinets with very limited access. This kind of pull out shelves allows you to use all the space afforded by the furniture, even if you can’t reach it directly with the cabinet door open. This type of kitchen cabinet storage solutions is available in one or two tiers. The design of the shelf resembles a cloud, hence the name. It looks very sleek and modern, thus fitting right in with contemporary kitchen designs. When buying the ‘cloud’ kitchen cupboard storage mechanism, pay attention to how smoothly it runs. You need a product with a soft close feature to avoid making a lot of noise every time you use it. Food storage container organizers are one of the simplest kinds of kitchen cabinet storage solutions. However, they are also one of the most efficient space-savers. They also help to keep your kitchen neat and tidy. This is the main reason to use this type of organizers. This tool is perfect for pantry organization and rather versatile in design. Examine your food storage containers collection closely to choose an organizer of a suitable size. You can install these solutions in cabinets and drawers for added versatility. Stick to coated stainless steel models as they are most durable. 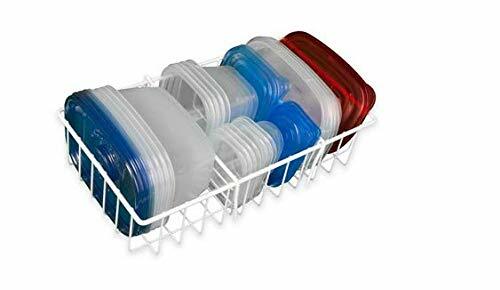 Utensil bin base organizers are an amazing solution not as much for saving space but for saving you time. 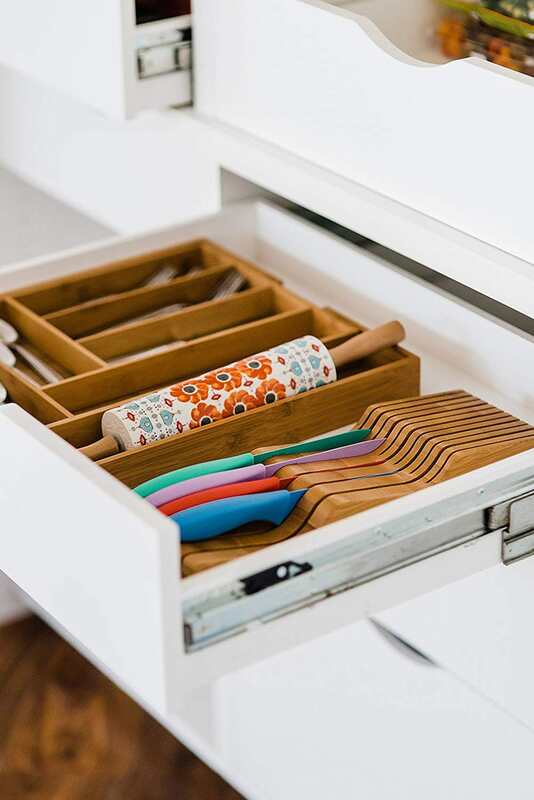 They will allow you to keep all your utensils sorted and organized neatly. You will definitely appreciate this when cooking as you won’t have to waste time rummaging through a drawer for that one spatula you need. This storage solution comes in a great variety of designs. Therefore, you will be able to find something that will fit in perfectly with your kitchen furniture. You should sort out your utensils first so you can decide exactly what kind of organizer configuration you need to store them best. 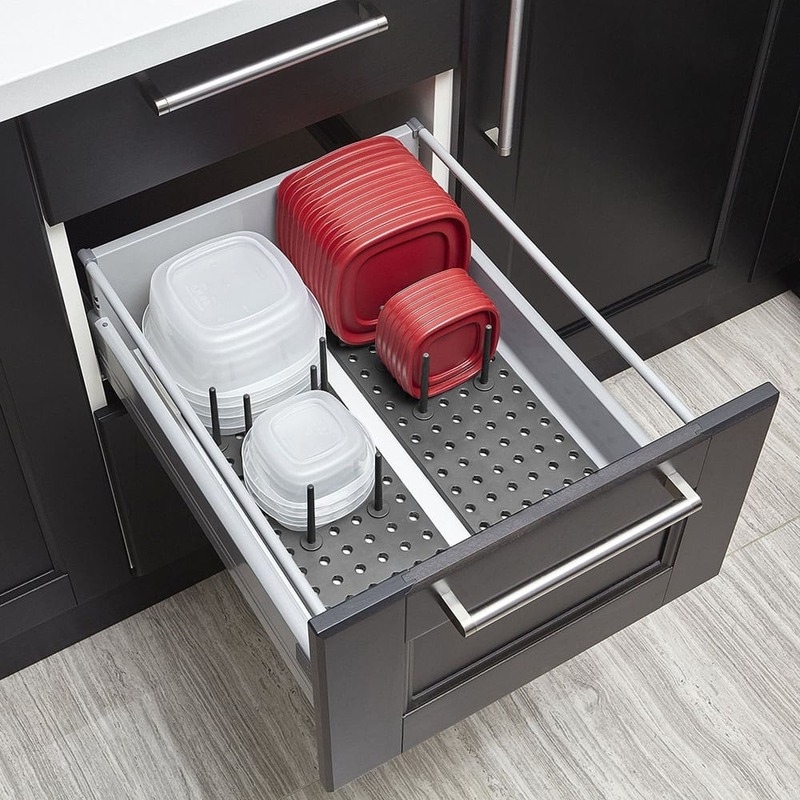 Base organizers are the more universal type of kitchen cabinet storage solutions. You can install them inside any cabinet, thus increasing its storage capacity. These organizers are rather simple to install and they are flexible, so you can adjust them to fit your existing furniture perfectly. Choose base kitchen cabinet organizers with adjustable shelves so you can customize them to fit your exact needs. These models can be modified at any moment. This means that you will be able to reconfigure them if your needs change. If you decide to buy this kind of pantry cabinet organizer, you should look for one with a top-quality sliding system. This hardware is responsible for the stability, so it must be reliable and durable. Base cabinet fillers are similar to base cabinet organizers with pullout adjustable shelves. However, instead of fitting within an existing pantry cabinet, they fill the space between two of those. These are kitchen cabinet storage solutions that help you make the most out of the space you have available. Therefore, they are a good addition for small kitchens. Such fillers are the best place for storing oil bottles and sauces. However, be sure to pick a model with sturdy rails. This will help you avoid unfortunate accidents with shattered bottles of oil ruining your flooring. Drawer peg systems are the best kitchen cabinet storage solutions for those who seek affordable and customizable organizers. The flexibility of these items makes them a perfect solution for everyone because you can adjust them to suit your exact needs. Whatever drawer organization ideas you have, you will be able to realize them using these peg systems. Personally, I use these organizer trays to keep all my cookware, utensils, and food storage containers well-ordered. These peg systems are very easy to set up, clean, and change. 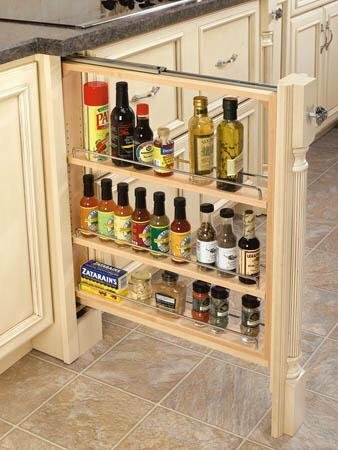 You can use them not only in drawers but pantry cabinets as well. Cutlery and utility inserts are a great and stylish solution that will help optimize your kitchen storage space. The best place for them is a drawer, but you can use these organizers to realize some clever kitchen design ideas. For example, bamboo models look so good, they can double up as stylish kitchen decorations. Utensil organizers can be expendable and they differ quite a lot in the number of compartments. Therefore, you should be able to find a perfect fit based on your personal requirements. Some of them are even adjustable in some extent. I recommend researching the multitude of options available to you thoroughly as there are so many of them. You’ll need time to find the one that’s truly perfect, but be sure it’s out there. I believe that spice drawer organizers are one of the most important kitchen cabinet storage solutions to have. They are essential for maintaining order among your spices and keeping the drawer clean. When shopping for this type of kitchen cabinet organizers, you should consider the type and size of spice containers they are meant to accommodate. 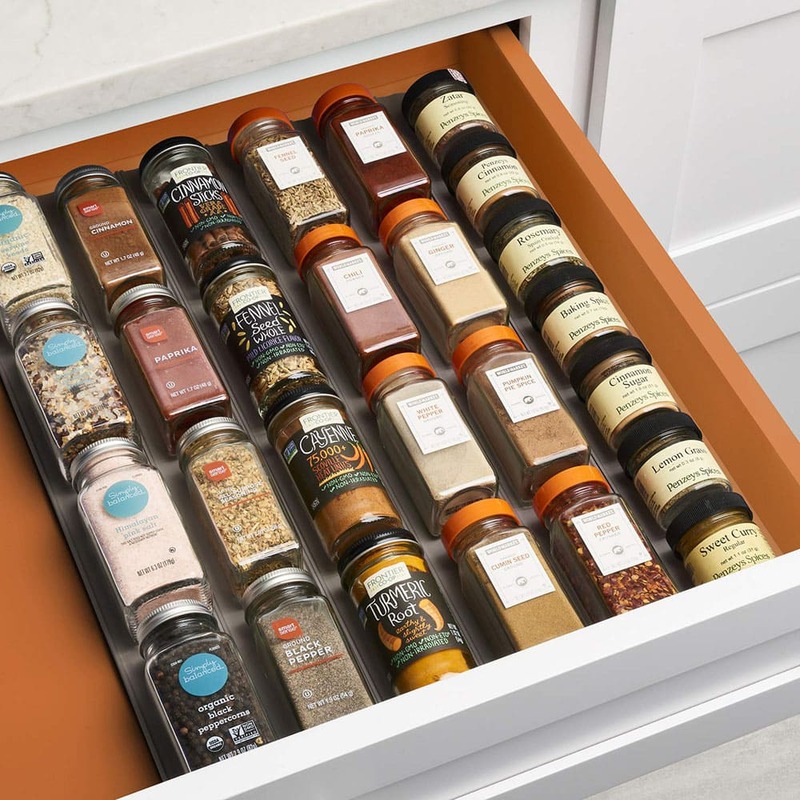 These are extremely versatile, so if you use different spice packages, finding a perfect organizer can be a challenge. 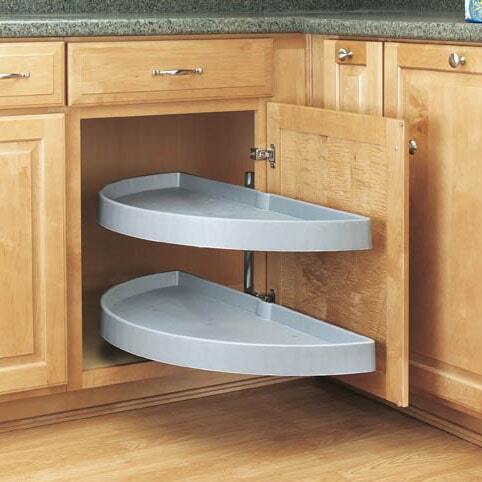 Note that this kitchen storage insert should be made from plastic instead of wood. This will make it easier to clean and it won’t absorb the smell of spices. 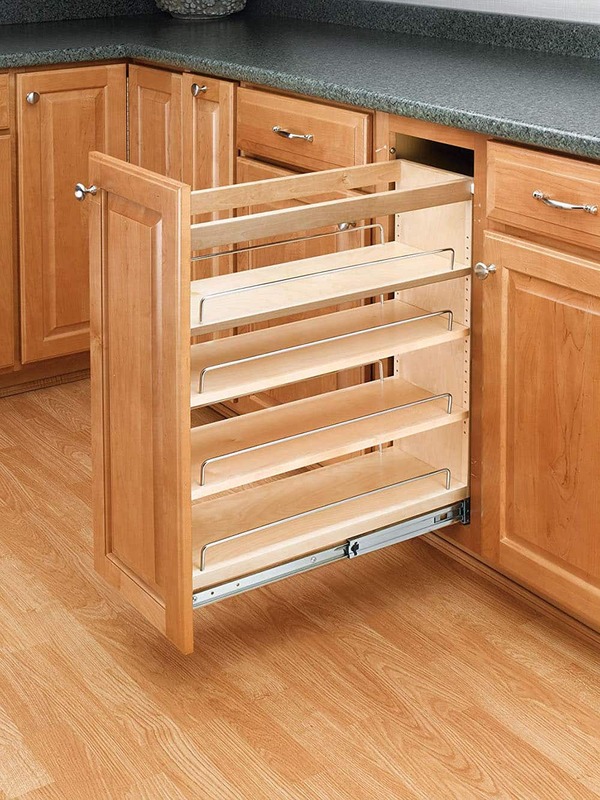 Susans are another popular type of blind corner kitchen cabinet organizers. They are rather functional and simple in design. They aren’t as elegant as ‘clouds’ but they are very practical. 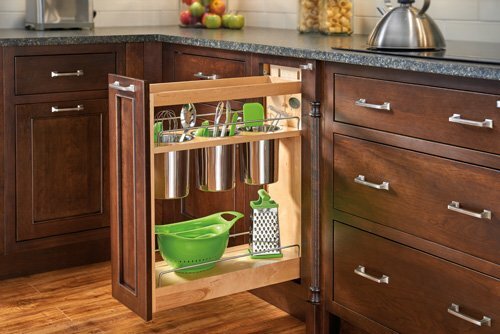 These kitchen cabinet storage solutions are designed specifically for small openings. Therefore, they are a very good choice for small kitchens. This organizer is for you if you are into minimalism and are looking for maximum function at minimal price. Tray dividers are a type of kitchen storage racks that make storing all your trays easy. Most importantly, some of the items you can find today are very stylish. Therefore, they can be used to enhance your kitchen décor when you use them to store your cutting boards on the counter. 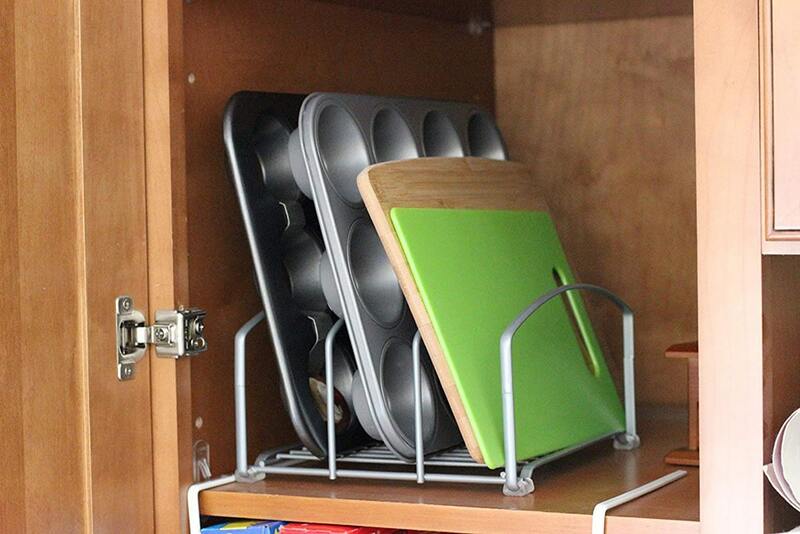 You can also use them if you want to keep your baking trays collection neatly hidden in one of the bottom cabinets. These items vary greatly in design and size, so you should find the one that fits any space. 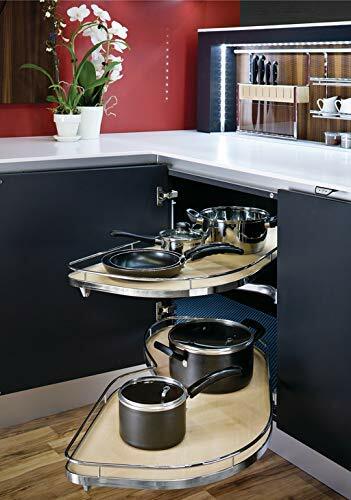 Pullout cookware organizers are one of the most amazing kitchen cabinet storage solutions you can find today. They are extremely helpful, so I advise investing in a high-quality one. These organizers are installed in a cupboard and allow storing all your pots, pans, and lids neatly stacked. Many of these organizers are adjustable and you can even order some custom made designs to fit your exact cookware collection. To make the most of any space, you should go for a two-tier model that can hold both lids and pots of different sizes. Tip out trays are a great solution for small kitchens with limited space on the counter. This type of basic kitchen storage units will work best when installed right under the sink. You can use them for storing soap and other dishwashing paraphernalia. These pieces can ‘hide’ some of the least attractive things that you need to keep close to the sink. They will look good in any setting. The versatility of sizes and designs means you should be able to find an exact match for your kitchen furniture. Of all the kitchen cabinet storage solutions that I have, I love s soft close waste bin the most. It’s because this simple solution makes the nastiest part of the kitchen discreet. 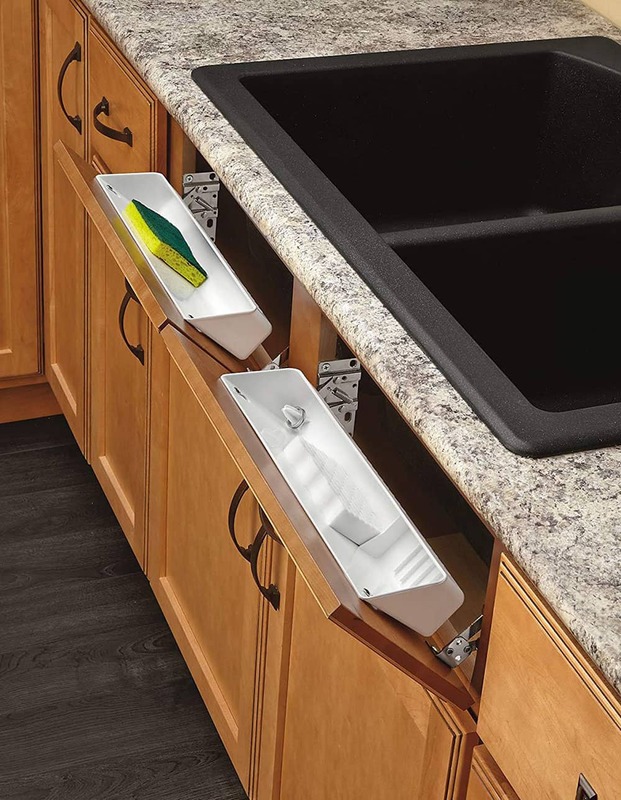 The bin neatly hides within a cabinet and modern hardware makes it slide in and out smoothly and silently. There are models that can accommodate several waste containers today. They are the best choice if you sort your waste to dispose of it in the most eco-friendly manner. The hardware can fit into any existing cabinet. Keeping the contents of your kitchen organized makes it easier to keep track of all due dates and other important factors. Simply put, it’s easier to notice when something needs to be replaced. Most importantly, when everything is stored carefully, there is less risk that some pricy cookware will get damaged. You also save money because you won’t be buying duplicates. Organized storage means you’ll always be aware of what you do and do not have in the kitchen. For me personally, the main reason to use kitchen cabinet storage solutions is that they help me save time on cooking. When all items I need are organized efficiently, I can save a few minutes both on preparation and cleanup. The entire cooking process becomes faster, and every spare moment to spend with my family is precious. If you are one of the modern people who lead extremely busy lives, you will definitely appreciate the time saving as well. And don’t forget that efficient pantry organization also helps you cut down the cleaning time. It makes the cleanup easier in general. Psychologists agree that an uncluttered organized space offers a variety of mental benefits. It’s so effective that it can even help reduce anxiety, which is the second among the most common mental disorders. Using such items can also help you reduce some money-related stress. Some clever small kitchen storage ideas can make your limited space seem less of a burden. And there are many DIY instructions for making kitchen cabinet organizers. Therefore, you can get these helpful solutions even on a shoestring budget. 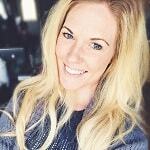 If you need more advice on how to make the most of little money, read this post. Keeping your stuff all neatly organized with the help of kitchen cabinet storage solutions simplifies meal planning. This means that writing a plan for grocery shopping also becomes an easier task overall. Most importantly, keeping track of all your pantry cabinet contents, means you can use your resources with maximum efficiency. Therefore, you get more opportunities to save money through clever meal planning. If you have a small kitchen, cabinet storage solutions will be a lifesaver. They will allow you to use every little bit of it and fit all the necessary cookware and utensils into the room. Using a variety of kitchen cabinet organizers and other helpful units also ensures that your tiny kitchen doesn’t look cluttered. Do you often have relatives or friends visiting for a few days? Do you rent out a part of your property? If your answer to either of these questions is ‘yes’, your guests are sure to appreciate all kitchen cupboard storage organizers. Note that having all important items well organized does not only make it easier for people to find them. It also makes it easier for them to put them back right where they belong. Therefore, you get less stressed over someone messing up your kitchen. You shouldn’t forget that installing a variety of kitchen cabinet storage solutions is only the first step to pantry organization. You also need to place all cookware, foods, and utensils in the most efficient way. And you need to find a way not to mess up your orderly organization and make sure your family members don’t do this by accident. To avoid these issues, you should create a kitchen organization plan. Preferably, hang it somewhere in the room so everyone can see it easily. You can remove it after everyone memorizes the layout, or leave it on for visitors. Even with a plan hanging on your fridge, some things are bound to get misplaced. You should sweep the entire room once a week to fix any issues. While at it, you should also go over expiration dates on the food you store in the pantry and use the info to aid in your meal planning. The final step to keeping your kitchen organized is doing a complete overhaul once a year. You might choose to install some new pieces or adjust the ones you have now. While at it, you should also run maintenance on all cupboard organizers’ hardware you have. Doing this kind of overhaul can also help you get some personal satisfaction when you can’t afford to renovate the room. So, what are your thoughts on kitchen cabinet storage solutions? Do you use any at home? Do you have some organizers I haven’t listed here? Did you make yours yourself or buy them from a store? Please, share your answers and any suggestions of better pantry organizers in the comments!